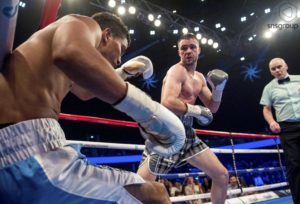 Scotland’s Finest were on display at the SSE Hydro Arena in Glasgow last night as Cyclone Promotions featured five title fights on their first show of 2018 with all eyes on one man – Josh Taylor. The Tartan Tornado is a man avoided fervently at the top of the lightweight division with his impressive array of attributes being enough to scare off all bar a few plucky warriors. Having to go about things the hard way, then, Taylor was looking to force his way into a world title shot as he faced Winston Campos, of Nicaragua, for the WBC Silver title following a late withdrawal to Humberto Soto. Having produced career best performances across the board in 2017, Barry McGuigan’s protégé was tipped to make an explosive start to this year and backed himself to deal convincingly with the threat of Campos. Should Taylor come through this battle unscathed then a WBC world title eliminator had been provisionally pencilled in for June but the whole of Scotland knew they could look no further than the busy, gritty, South American. For now, anyway. Dubbed a “southpaw banana skin” for Taylor, Campos was hoping the Scotsman would slip up against him and, in doing so, provide a platform for the big time. From the outset Taylor marked his intentions by rushing to the centre of the ring and aiming a stiff jab into the face of Campos – the Nicaraguan looked rocked and was caught by subsequent hard-hitting jabs. Having said that Campos played into the hands of the South American fighting stereotype by bouncing around the ring and looking comfortable from range. All the signs were, however, that as soon as Taylor was allowed, nay decided, to close the gap and attack Campos up close that his opponent would then succumb to The Tartan Tornado. Big, looping, booming hooks only went to reinforce Taylor’s early dominance and despite Campos hitting the canvas at the end of the first round it was ruled merely a slip, a dubious one though. Round Two began in an upbeat fashion with Campos firing in a few shots to the body of Taylor with, admittedly, little impact but more as if to say “hey, I’m not going to be a walkover”. Cyclone’s Champion responded however with a punishing right hook after an attempted counter-punch from the late replacement opponent, to put Campos in a world full of trouble. Shot after shot into the body of his opponent saw El Zurdo crumble to the canvas in credit to a scything body punch – the story would be repeated mere moments later when the South American ate repeated right hooks from Taylor and fell to the canvas again. Hanging in via sheer guts alone the 25 year old foolishly turned his back in the opening moments of the third and fell victim to a ferocious onslaught of punches from the former Scottish amateur sensation with savage left hooks draining the stamina from his legs. Whilst managing to get up before the count of four, referee Victor Loughlin had seen enough to suggest that the southpaw was only going to suffer unnecessary punishment should the bout have continued. A third round knockout to add to Taylor’s collection now making it 11 from 12 as The Tartan Tornado looks set to be on a destruction path of the lightweight division in 2018… let’s get it on! The other results from the night featured Glenn Foot capturing the Commonwealth Super Lightweight title following a rapturous contest with Jason Easton – arguably domestic fight of the year – Foot landed the first punch of the night and within thirty seconds the pair were tearing into each-other from within the space of a postage stamp. Wild swinging left and right hands by Easton were countered by tight, inside body punches. Both fighters loaded up with real vigour and spite packed into their punches and whilst neither landed clean enough to spin the jaw of their counterpart, each punch added to the sheer spectacle of the contest. Jabs were to be the order of the day for Easton in order to be successful but throughout the opening rounds they were found to be lacking in the extreme as Foot was never disrupted from laying leather into the home-crowd favourite. The tempo followed the same as that of Foot’s last bout, with Josh Leather, – that contest for the IBF European title – and the fighter was fortunate enough to be displaying the best performance of his career whereas Easton seemed to be hindered by emotion. A thunderous left overhand straight into the face of Easton gained audible gasps from the paying spectators and, at first glance, looked to break the nose of the Scotsman. With both men throwing their whole weight with each punch it was a miracle, almost, that neither ended up cold but the war raged on into the second half of the fight. An incredible bout worthy of being a headlining contest, should we see the rematch, both fighters were gutsy throughout battle with sickening body shots from Easton only being matched with equal fire from the Sunderland man. Easton looked to exploded towards the latter stages and with each shot slammed into the head of Foot, you felt his confidence grow and, with it, his fighting began to feel all the more fluid. On paper this was a good fight, in the ring it was an EXCEPTIONAL fight and proof, if any was needed, that trading punches is always going to produce a viewing spectacle to delight the masses. Into the championship rounds we went although you’d be forgiven for thinking the bout had just started thanks to the sheer constant barrage of shots being fired, a simply sumptuous right hook into the side of Foot’s face left the 30 year old visibly dazed, borderline concussed, and Easton began to tee off on what was, temporarily, a sandbag begging to be hit. All that was keeping Glenn Foot up was the sheer courage in his heart and the heaviness of his legs willing not to go down but boy, did it bring out even more from the fighter, who survived only to follow up with huge right hands of his own. The 11th round was to be the home of the crescendo as an amalgamation of all that had been before, the build-up of all the fire, resulted in one big explosion. This barnstormer, cream-cracker of a fight had a climax witnessed only before in Athenian battlegrounds but was bestowed upon a packed, salivating SSE Hydro Arena crowd; toe-to-toe action, would we expect any more, saw Sunderland’s saviour shellac the dreams of Easton into disarray with a concussive crack of a right hand sending the whole of Scotland into shock and with that final punch, the fight was over as Glenn Foot won the Commonwealth title in a fight to go down in the history books. 10 rounds of boxing scheduled for the vacant Celtic Lightweight title took place as “The Railman” Ryan Collins took on “The Mailman” Charlie Flynn. Going into the fight it was hard to tell who the betting favourite was and given that their previous fight, 11 months ago, ended in a head collision there was very little to take from that. Flynn started off by taking to the centre of the ring and his physical superiority made an immediate impact when a huge right hand sent Collins to the canvas with just 40 seconds gone of the first round; on weak legs, Collins looked rattled and Flynn was able to land shots at will. Almost as though he was out of his depth the expression on Ryan Collins was one of bewilderment and did well to box at range, being sensible, but Flynn’s grit and determination earned him the unquestionable better of the opening round. A cagey round followed with Flynn controlling the distance of the bout with ease – Collins often found himself coming up short with his punches – but both men kept their legs moving as they navigated the ring comprehensively with neither fighter really wanting to ignite the contest into a barn-burner. The most pertinent observation over the cause of the opening two rounds was the repeated near-head-collisions between the two men, giving rise to fears that this fight could be equally as short-lived as their first duel. And so it proved in the third when a visibly wincing Flynn was struck by the head of Collins during an up-close exchange of punches. Fortunately there was no major damage and the 24 year old recovered to pressure Collins into a real toe-to-toe battle – the first real round where both boxers could lay claim to having won it. With rounds in the bank and the tempo of the fight set, Charlie Flynn was able to establish his authority in the following round as his controlling jab continued to pop into the face of Collins followed up by varied combinations to the body of his opponent. Boxing well and securing the rounds on the judges’ scorecards. Just at this fight was looking to kick into life there was déjà vu of incomprehensible magnitude as both boxers leaned in and smashed heads. Gaping cuts emerged on the forehead of both with oozes of blood flowing out of the gashes. Sometimes it’s best just to put things in the past and move on – for Collins and Flynn, after their second technical draw, I think that’s the best bet for both men. On the undercard lightweight sensation Chantelle Cameron looked to defend her IBO title over former world title challenger Myriam Dellal – the champion looked to be on an unstoppable rise but the challenger boasted the experience necessary to render this a competitive fight. To be brutally, brutally, honest this fight provided very little to write about with the performance perhaps best described as clinical. That’s in no way to suggest that Chantelle Cameron’s fight was anything short of top-drawer, just to say that the contest followed the same pattern throughout the 10 rounds. In truth this was probably one of Chantelle Cameron’s best performances as Wham Bam Cam proved to be technically superb with her balance and footwork being nothing short of sublime. The former GB amateur proved that it’s not all about flashy knockouts and rather her ability to dictate the pace and position at which the fight was fought was the defining aspect of her fight-plan. Dellal was not a slouch and came to win but the sheer gulf in class was undeniable as Britain’s best female boxer dominated the rounds by out-manoeuvring the Frenchwoman before firing off rapid combination shots with incredible hand speed. A superb performance from Chantelle Cameron if, admittedly, a little less explosive and extravagant than many had been hoping for. Who knows, hopefully the next fight will warrant more in-depth commentary. The rest of the results were as followed; Marc Kerr knocked out Iain Trotter in the third round to secure the Scottish Area middleweight title and now goes 6-0; Lee McGregor continued his perfect record by knocking out Pablo Narvaez to move 3 and 0 and Malik Zinad goes to 11-0 thanks to a 2nd round knockout. If that was Scotland’s Finest then roll on 2018 because what a year it’s going to be!